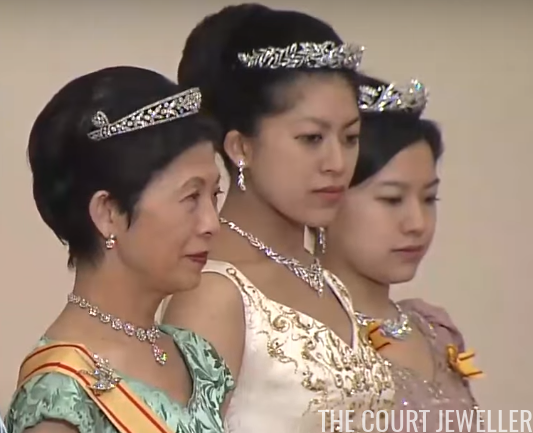 Our survey of the lovely tiaras worn by the women of Japan's imperial family continues this weekend with a look at the jewels worn by Hisako, the widow of the Prince Takamado. 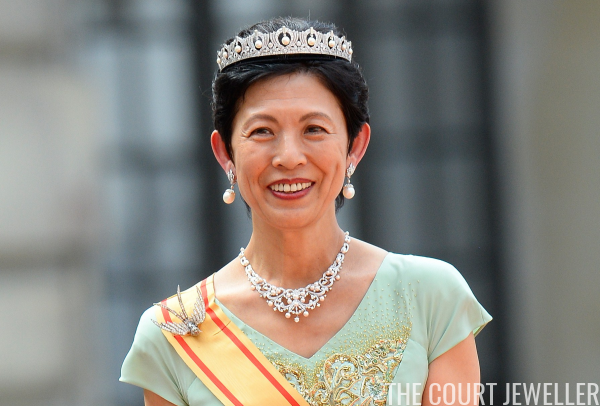 Because she often represents the family abroad, the Princess Takamado has several glittering sparklers at her disposal. 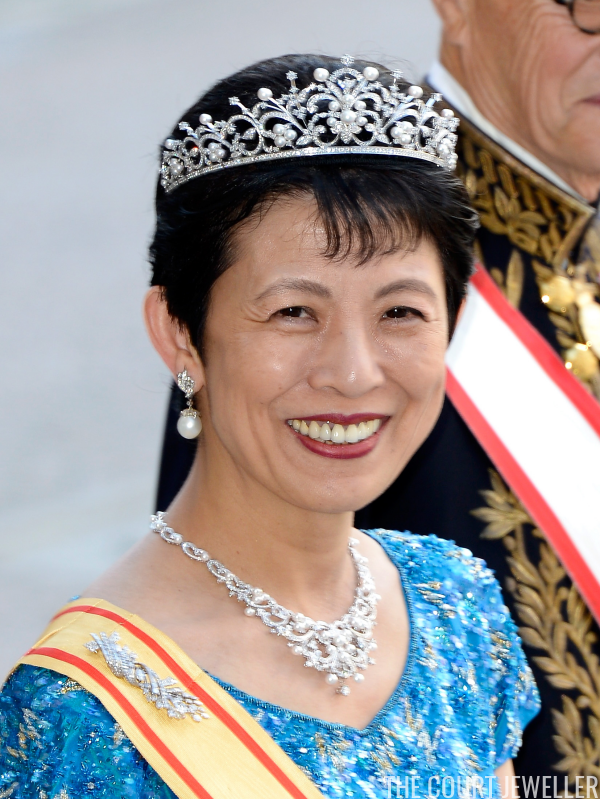 This pearl and diamond scroll tiara is the first one from Hisako's jewel collection; she wore it in 1984 for her wedding to the Prince Takamado, who was a first cousin of Emperor Akihito. (Here's a link to a wedding picture.) 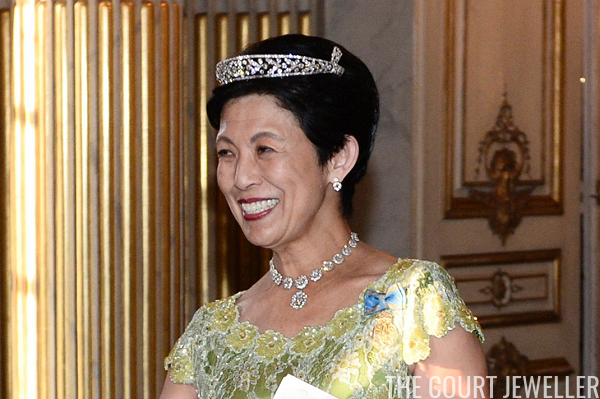 The tiara, which has a coordinating "mirrored" necklace, is still worn by Hisako today. Above, she wears the tiara and necklace at the wedding of Princess Madeleine of Sweden in June 2013. 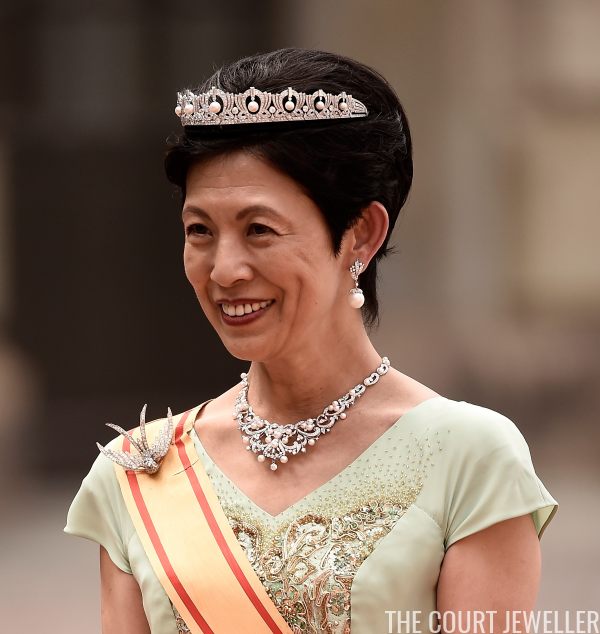 Hisako wore her wedding necklace again in June 2015 for the wedding of Prince Carl Philip of Sweden, but on this occasion, she paired it with a small diamond and pearl drop tiara. This sparkler was previously worn by Princess Yasuko of Mikasa, one of Hisako's sisters-in-law. Like all Japanese princesses who marry commoners, Yasuko left her imperial jewelry behind when she married Tadateru Konoe in December 1966. 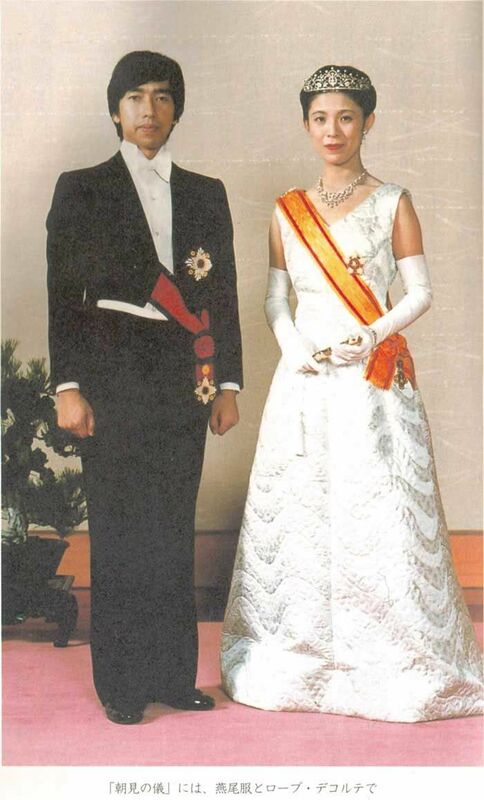 The picture above was taken at a reception held on the day before Yasuko's wedding, so it's almost certainly the last time she was seen wearing the tiara in public. Hisako also has a third tiara, a delicate diamond bandeau with a classical laurel leaf design. She often pairs it with a necklace made of diamond clusters. Above, she wears the tiara and the necklace at a birthday gala for King Carl XVI Gustaf of Sweden in April 2016.